I hope I chance upon the original, and get a go at photoing it myself. I speculated recently that photoing sculpture might be easier to do well in cloudy light. I also recently speculated that something similar might well apply with brightly coloured vehicles. The above bright yellow taxi would seem to confirm this. Next advert-taxi target, this very cute Swarovski taxi. 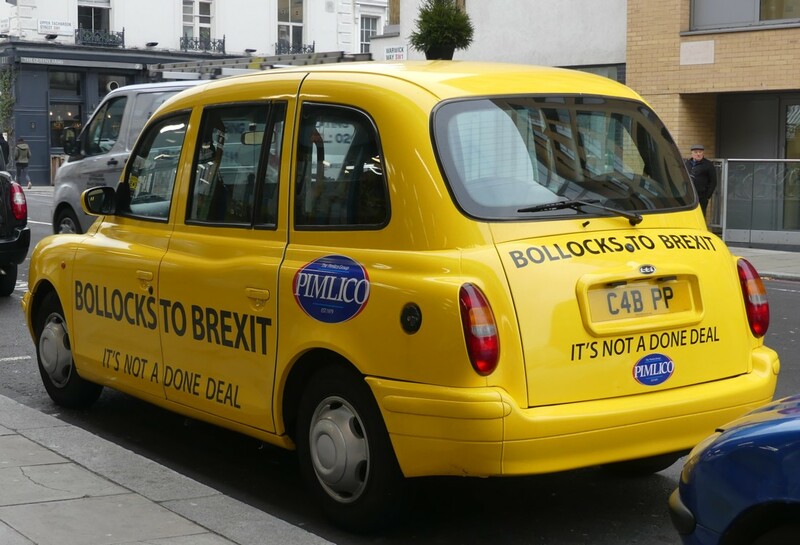 I have already spotted one of these taxis twice, but my first sighting was in the dark with me burdened with laundrette stuff, and my second sighting was yesterday morning, but after I had been shopping and was thus similarly burdened. I tried to photo it, but it had moved on before I could. Photoing taxis is a lot easier when they are parked. It is also easier if the driver is not present. If he is, I say I am interested in his advert, and ask permission to photo first. Once they know you aren’t snooping on their parking habits, they’re usually very agreeable.